The number of Russians viewing this blog is continuing at an exceptionally high level. Here are the figures of the top ten countries during the past week. Yesterday there were a total of 1185 viewings, which is quite exceptional, and it seems that most of these were from Russians. Why should this be? 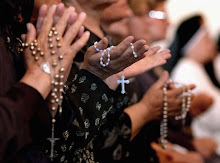 The most visited post since the beginning of this blog is the one entitled Fr William Charlton in September 2011. It is still regularly visited, almost five years after posting. I have no idea why there is currently so much interest from Russia. The annual walking pilgrimage to Walsingham organised by the Latin Mass Society will take place over the August Bank Holiday weekend. Pilgrims will gather in Ely on the evening of Thursday 25th August and will arrive in Walsingham around midday on the Sunday. The distance is about 55 miles, so it is not for the feint-hearted. However, in the past, it has been completed by small children and people in their 70s and even 80s. Accommodation is in halls for women and camping for men. To read all about it, and to book, go to the Latin Mass Society website and look under news and events. Footnote: The Latin Mass Society also welcomes day visitors to Walsingham on the Sunday. There will be a Solemn Mass at 2pm at the Catholic Shrine, followed by a procession along the Holy Mile and final prayers in the Abbey grounds. If you are not able to walk the 55 miles, why not join the pilgrimage in Walsingham. I have read a post on the blog of Fr Ed Tomlinson, who is an Ordinariate Priest in Kent, on the subject of facing East. Five years ago, he took over the church of St Anselm in Pembury which during the week served as a hall and consequently only had the most basic of altars. Unsurprisingly it was used ad populum. Gradually, a sancturary has been created with a new more dignified altar, lectern, pulpit and now choir stalls. Because of very limited space, the new, larger altar was installed for ad orientem use. The altar rails, altar steps and a fine reredos are shortly to be installed. Father Tomlinson has commented that there was hardly a ripple of objection to the change to ad orientem. He also states that whilst these changes have been taking place, the average of the congregation has got younger, and their contributions have gone up. What better recommendation could one hope for! I traveled to Preston on Sunday to attend the Pontifical Low Mass celebrated by Bishop Campbell. Bishop Campbell will soon reach retirement age, so there may not be many more opportunities to see Bishop Campbell in action. As one would expect, the Mass was exactly as one would expect a Pontifical Low Mass to be, although the choir did sing some hymns and there was exemplary organ playing. After Mass, Bishop Campbell was available to talk to anyone who approached him, and most did. He gave the impression of being really pleased to be at St Walburge's. Indeed, I would not be surprised if it the church of the diocese that he likes visiting most. This isn't, strictly speaking a Middlesbrough event, but as the Rudgates have contributed so much to the Traditional Liturgy in the Diocese, it is worth mentioning here. Palestrina Missa Papae Marcelli & motets also by Palestrina, concluding with the Solemn Salve Regina written for St. Mary's Abbey in York. I travelled to St Mary's Church in Warrington yesterday for the first Solemn Mass of Fr James Mawdsley. It was a great occasion with a good sized congregation, and very good singing of Byrd's Mass in Five Parts. Afterwards food was laid on in the rectory garden, which provided the opportunity to talk to several interesting people. Among them were four FSSP seminarians, from England and Wales. It really is a joy to meet these young men who, deus vult, will one day be serving as priests in England. I also had an interesting conversation with Fr de Malleray. It has been fairly widely reported today that Cardinal Nichols, Archbishop of Westminster, has wasted little time contacting the clergy of his diocese, and essentially urging them to ignore the words of Cardinal Sarah concerning the celebration of Mass ad orientem. (See post below). It is noteworthy that Cardinal Nichols is speaking for himself, and not on behalf of the Bishops' Conference of England and Wales. So far as I am aware, no other bishop of England or Wales (or indeed of the world) has responded similarly. The conclusion that we must make, is that Cardinal Nichols has an agenda all of his own, and it is one that is antagonistic to the traditional movement in the Church. It is also one that will not be welcomed by a significant proportion of his clergy, and of his flock. 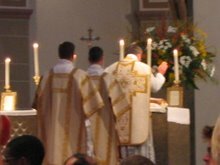 Today is the ninth anniversary of the promulgation of Summorum Pontificum. He is, of course, talking about celebration of the Mass in the Novus Ordo, but it is nevertheless a very significant development. The quotation is taken from the Catholic Herald.